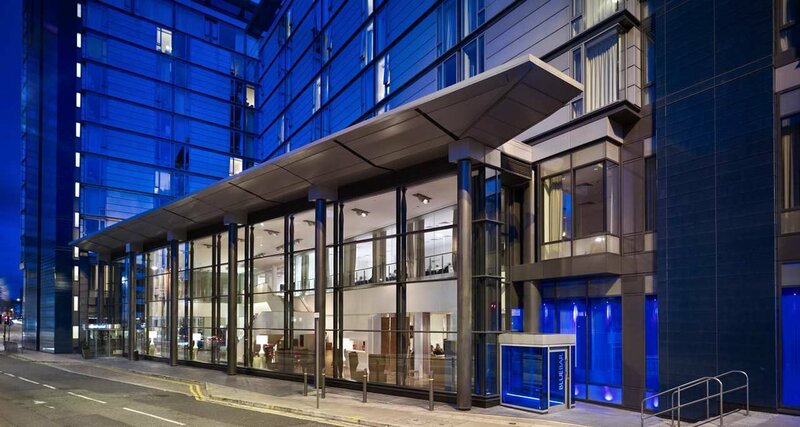 On December 19th, I was invited to the DoubleTree by Hilton Manchester Piccadilly as part of the Hilton’s campaign to rediscover Hilton hotels. Both me and the other half were welcomed for the night to stay in one of their beautiful rooms as well as being guests for both dinner and breakfast. 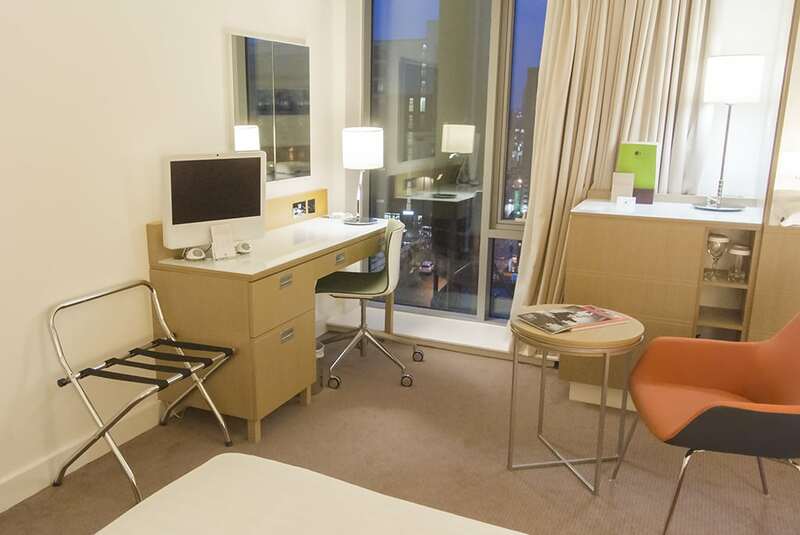 Whereas Hilton hotels can have any star rating, DoubleTree by Hilton all have a minimum of 4 stars and tend to be located in more business oriented areas, with the Manchester Piccadilly hotel being just across from Piccadilly train station. On our arrival, we were checked in speedily and handed delicious warm cookies before proceeding immediately to our room. 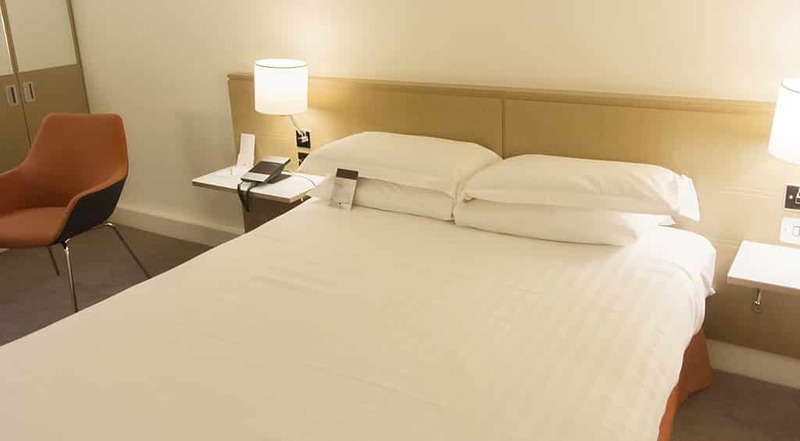 The room was bright, well-lit, soft and luxurious with a queen-sized bed, wardrobes, spacious desk, easy-chair and side table, night stands as well as a luggage rack. The desk was equipped with a fully operational iMac with unlimited internet access, TV, DVD capabilities, everything you might expect from a full desktop system in your room and as an iMac user, I felt really at home, plus there was unlimited WiFi. The carpet was soft and our tall window looked down onto Piccadilly train station where I spent a few minutes watching surge after surge of people come and go, armed with shopping bags and suit cases. The bed itself was practical and the other half got a good night’s sleep. 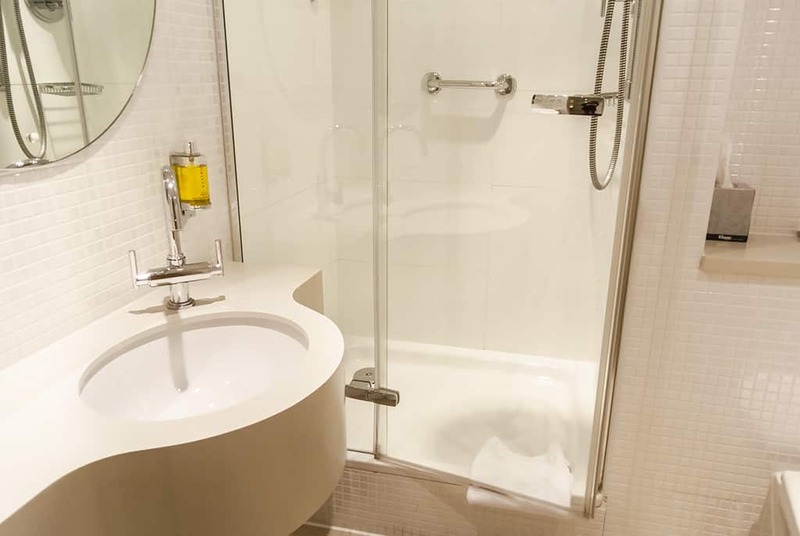 The en suite was compact with a shower, toilet and sink, all beautifully finished and spotless. The bathroom products, which I’m always aching to find out what they are, were Citron by Crabtree & Evelyn which was a really pleasant surprise with Shampoo, Conditioner, Body Wash, Facial Soap and Hand Wash as well as a little grooming kit with buds and cotton balls. The shower was powerful and the layout of the bathroom was very convenient. There were two full sets of towels, but what made me again feel more at home were the towelled bath robes. So after arriving, we hit Manchester which, as you can imagine, was hectic to say the least being only 5 days before Christmas. We wandered (fought) through the Arndale Centre browsing and spending in Hotel Chocolat, Lush, and the Croc shop before heaving a sigh of relief as we entered the evening air and wandered down near the Royal Exchange and the large M&S. The streets were busy as the Christmas market was in full swing, but we’d decided to hold off on those until the next day where we spent our time leisurely walking through the markets with mulled wine and hot chocolate with Baileys. Yum. After taking the Metro Shuttle back to the Hotel, we went up to change and then went down to the Restaurant, situated to the right of reception. The restaurant is open plan with floor to ceiling columns, all cream, white and very spacious. Greeted by the maître d’, we were seated with menus in hand. I opted for the à la carte which came to around £40, whilst the other half went for the seasonal menu priced £22.95. 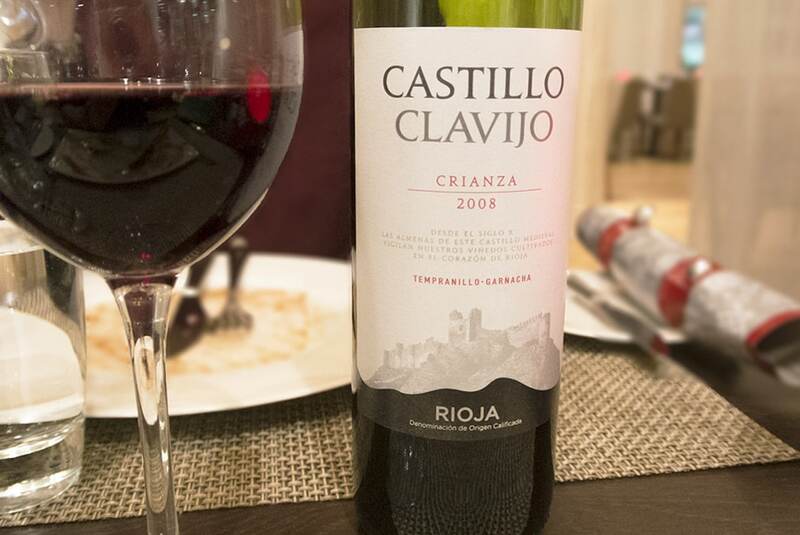 After choosing our wine, the Castillo Clavijo Crianza (2008 Spanish tempranillo & garnacha), we were served a selection of breads with dipping oil and balsamic which was proceeded quickly by our starters. 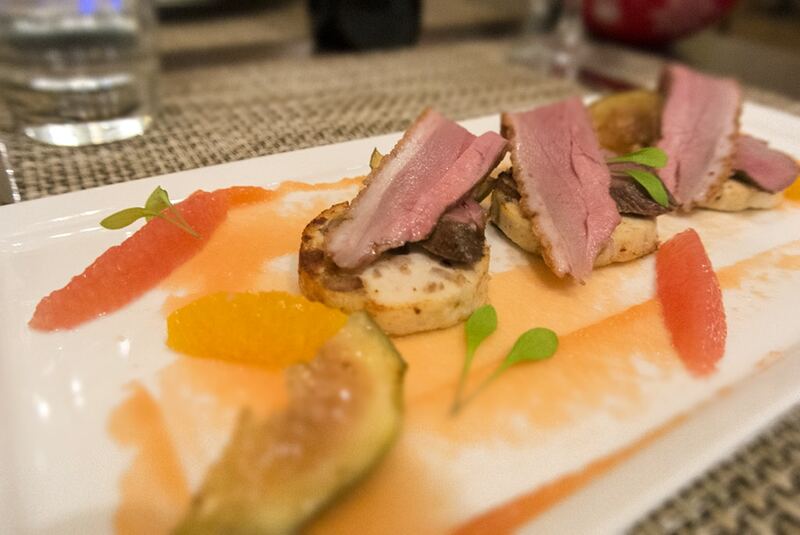 I had the smoked duck breast (pictured) served with confit duck leg, fig, orange and salad and he had the beetroot tarte tatin with goatscheese fritters and a balsamic dressing. Both were beautifully served and most importantly, hot. Needless to say they were delicious, and the absolute silence between us demonstrated how much we enjoyed the course. After finishing our starters, we were brought two glasses of warm mulled wine served in sherry glasses before moving on to our mains. 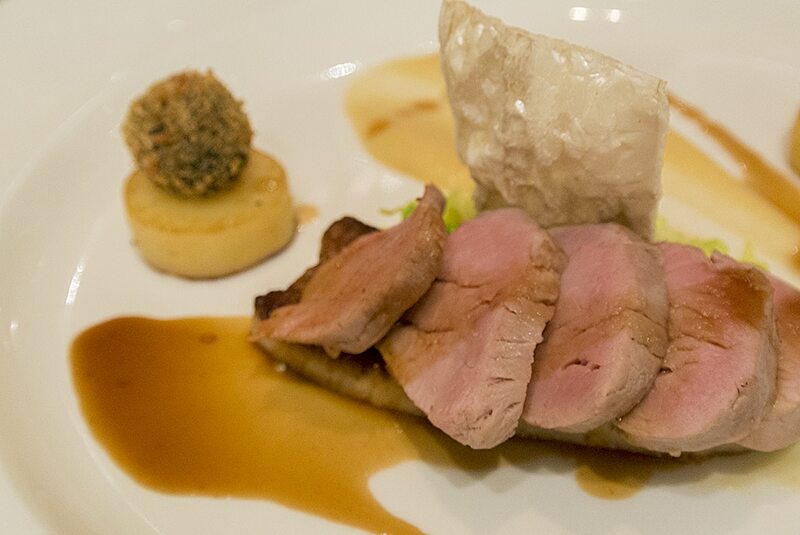 The main course for me was trio of pork – smoked pork belly, loin of pork and black pudding bonbon, pear puree and cabbage. His was a delicious and succulent roast turkey Christmas dinner with all the trimmings. Both plates were stunning to say the least. Throughout our dining, the staff were really attentive and our wine, water and bread bowl were never empty. Ellie and Robert were our two principal waitstaff who were brilliantly knowledgable about everything coming out of the kitchen; both appeared to have a genuine love for what they were doing. We also ordered a side of hand cut chips to share between us which in retrospect, was unnecessary, but still delicious. After a short break, it was time for dessert, bearing in mind that by this point we’d had two deliciously rich courses, plenty bread, wine, mulled wine all aided along with spring water. I was told by Ellie that my choice for dessert was “the right choice”, as I selected the Snickers Crème Brûlée served on caramel sauce with a cube of peanut butter mousse, coated in crushed peanuts. 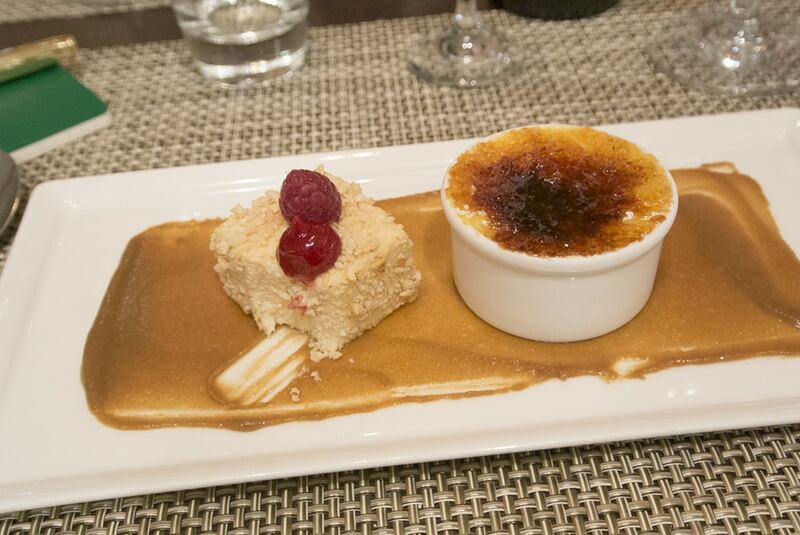 The Crème Brûlée actually had a whole melted Snickers at the bottom … sorry … my mind drifted back for a second there. The other half had the hazelnut cheesecake with chef-made marshmallows. Both were perfect summations to a perfect meal. 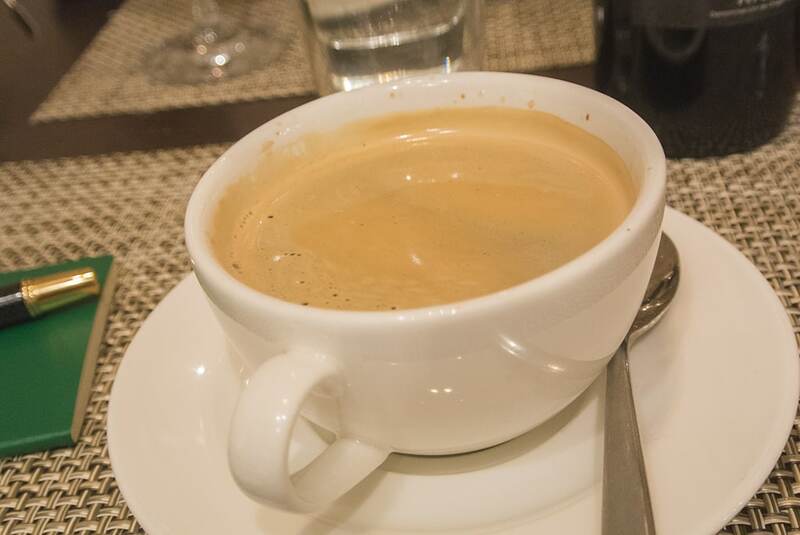 We were then offered a coffee, I had black and he had a latte, both served in a ‘proper’ coffee cup and tall glass. After these, we felt well and truly defeated, and had to turn down the offer of cocktails which was very unlike us both, but on the way back to our rooms we stood in the lift, looking at each other’s expression in the mirror, knowing we’d made the right decision. We’d regrettably bought some bits and pieces from M&S food during the day that remained undisturbed in the bag. Breakfast was a treat, served in the restaurant, you’re brought to your table and handed a menu card with options for a variety of differently prepared eggs. All the food is over at the buffet, both cooked and cold, with a full English, selection of muffins, pastries as well as cereals, toast and juices. It was delicious and incredible filling. I had a full English and left it at that where he had the same, plus toast and a yoghurt granola; I should say he’s as thin as a rake but eats like a man possessed. I’ve never been so lucky. Washed down with fruit juices, the breakfast was delicious and gorgeously cooked; the eggs, bacon and sausage, which can often end up rubbery, were perfect. The thought that really hit me, which hadn’t occurred to me before, is that if you’re going to travel a little out of your way to go shopping, proper shopping, life endangering shopping, then why ruin what can be a really great trip with delayed, slow and rammed, late-night public transport. Spend a night with the DoubleTree by Hilton where you can relax, eat well and recuperate, both leisurely and luxuriously. The prices are fantastic as a night’s stay is from around £59 per night (not incl. dinner and breakfast). I left feeling relaxed, well fed and ready to brave the rest of Christmas. 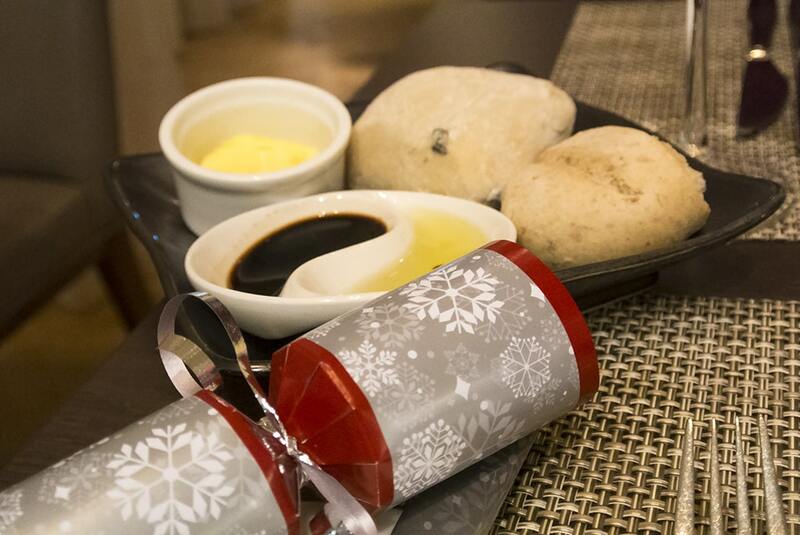 For more information and to book, head over to the DoubleTree by Hilton site here. This article first appeared on MANFACE written by Thom Watson. It was published on Friday 28th December 2012 and was last updated on Monday 3rd April 2017 at 4:03pm. It's categorised under Travel where you'll find more related content. I’m staying here in February so reading your review was incredibly helpful and encouraging. I can’t wait to stay there – it sounds like a fantastic hotel, especially looking forward to the wifi :P but the food sounds amazing! I want the cheesecake!